The Reading & Writing Project - Goodbye Summer Institutes, Hello Saturday Reunion! Goodbye Summer Institutes, Hello Saturday Reunion! Participants at the summer TCRWP institutes came from 68 countries and from every state. Included in their numbers were over 400 administrators, many mother-daughter pairs, a person attending her 22nd institute, dozens of people attending their sixth or seventh institute, and a man whose mother had brought him to the institute (where he’d waited in the dorm room for her each day) twenty years earlier when he was a 7 year old child. Also with us was a woman who has been hand-raising polar bear cubs in Alaska, and a team of 25 teacher-leaders from Saudi Arabia, including one whose wife was 8.5 months pregnant—and who waited for her husband’s return to give birth! While the August Reading Institute brought the sequence of four TC institutes to a close around the country, the final batch of homegrown institutes was just beginning. Some of the homegrown institutes were as small as twenty participants, some as large as 500. In each instance, staff developers and local district leaders thought hard about how to create an event that would not only convey state-of-the-art knowledge about reading and writing instruction but that would also nurture a professional learning community onsite within that district, that school. 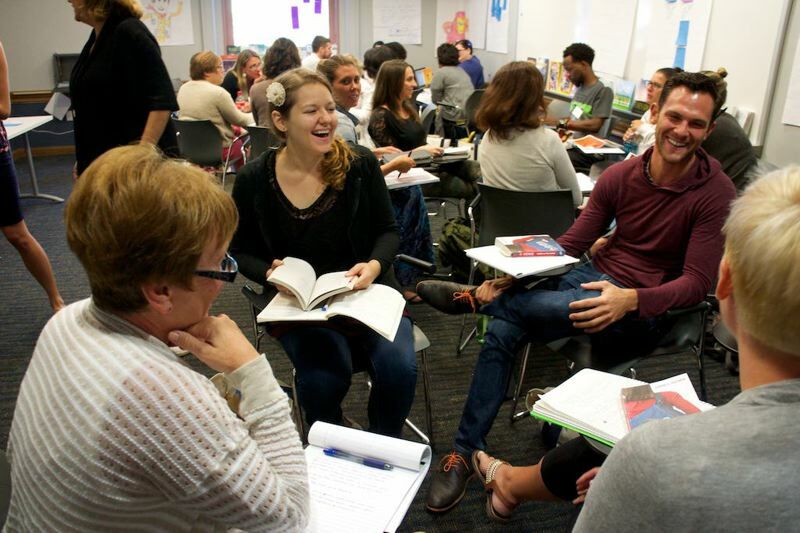 Reviews of these institutes are pouring in now, and suffice to say, people find it deeply significant to read, write, study student work, and plan teaching alongside one another, especially when their thinking is sparked by the Reading and Writing Project staff. “What’s next?” you ask. The October Reunion is just around the bend. Mark October 18th on your calendars and gather some friends together. This year, we’ve asked David Booth—who is perhaps TCRWP’s all-time favorite speaker—to keynote, and there will again be well over a hundred workshops on focused, grade-specific topics. As has been the tradition, this day is open to you all, with no pre-registration, no fee. Detailed information will be sent to our full mailing list closer to the event so get yourself on that mailing list! There will be two coaching institutes this year, as always. The coaching institute that supports writing starts on October 14th, and registration for it will open soon.